On Monday, while suffering from a horrible head cold I caught on a plane, I trudged out in my gigantic black puffy parka to walk the pup. It was an attempt at normalcy as I sneezed, sniffed and snorted out an ungodly amount of…never mind, enough said. Anyway, off we went, the pup at a happy trot, me sluggishly trailing behind. We walked up one street, the pup sniffing and marking his territory, me blowing my nose, eyes tearing from repeated sneezing. We continued along in this fashion until we got to East 58th Street, which turns into a weird, one-block, lane-less free for all during rush hour as cars simultaneously try to jam their way onto the Queensboro Bridge or head further east for…I don’t know, breakfast doughnuts. It was in this Thunderdomic stretch of block that the pup decided to really get down to business. As dutiful as can be, he headed to the curb for his intent sniffing of the perfect spot while I wiped my nose on my puffy sleeve. It was then that a horror-on-wheels started beeping maniacally as she barreled toward us, Cannonball-Run style. She was intent on cramming her four-wheeled hell machine into a space it couldn’t fit, and for her to do that, she needed the curb, you see. Also, it was a red light she was racing to stop at. So, I yank the pup away, process what was happening (snot now dripping down my face) and then realized that this hellacious driver stopped her tin can three feet ahead of where the pup and I stood (eyes at this point watering out of fury). Again, it bears mentioning, she was stopped at a red light. Not only that, but she was typing away at her Blackberry. In other words, a captive audience to whatever I had to say to her. For the three people who read this blog, you’ll recall that my patience runs out pretty fast with driving mishaps. It runs out doubly fast when I’m nearly run over with the pup. So I stood where she could see me. 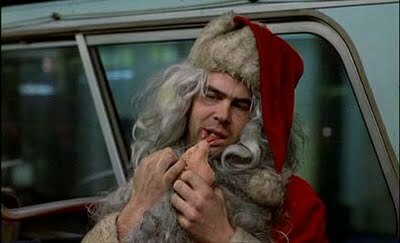 Admittedly, I looked like a cross between the grim reaper (sans scythe) and Dan Ackroyd in Trading Places when he’s dressed up like Santa Claus (I’m referring to the hair, not the salmon). Green light. She sped off. I think the sarcasm made it through the passenger’s side window, which was closed. Also, I’m certain she thought I was crazy—will blame that on the cold medicine. The point here is, I considered the moment–however bizarre, medicine-induced and off-kilter it was–to be one of personal growth. Why? Because nary an expletive was used. It’s the small victories in life. So, today is Friday and I’ve stopped wishing that woman’s thumbs to fall off (another great leap forward). Also, my cold is gone—just in time for the weekend! Used properly, cold medicine can indeed be a transformative thing. Oh. My. God. This is so funny. Very Funny. Snorted in an unladylike manner. You showed great restraint. If someone tried to run over my dog I would struggle not to run after them with a pitchfork!